Home World News Ghana to Elects President Today. Ghana to Elects President Today. 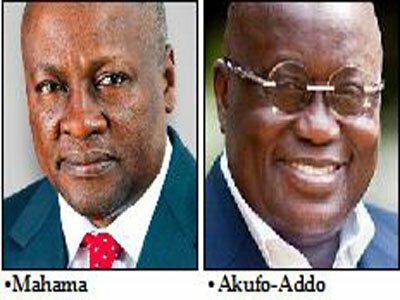 President John Mahama will slug it out with his main rival Nana Akufo-Addo as Ghanaians elect their president and lawmakers today. There are 15.8 million registered voters who will determine the direction the West African country will go. Apart from the president, 275 members of parliament will be elected across the country. The president will be elected using the two-round system. The lawmakers will be elected in single-member constituencies using first-past-the-post voting. Campaigns ended on Monday with Mahama of the National Democratic Congress (NDC) and Akufo-Addo of the New Patriotic party (NPP) as leading candidates. Eligible voters must be Ghanaian citizens who are at least 18 years old, although those declared insane are disenfranchised. Parliamentary candidates must be Ghanaian citizens at least 21 years old, and either be resident in their constituency or have lived there for at least five of the ten years prior to the election. Over 16 people filed with the election commission to run for president. However, 13 presidential candidates were disqualified due to incorrect filling procedures. Ivor Greenstreet from the Convention People’s Party is the first physically-challenged candidate to contest the presidential election. President Mahama has joked he is known as “Mr Dumsor” – a reference to the power cuts that have plagued Ghana during his first term in office. “Dum” means off and “sor” means on in the local Twi language and Mr Mahama has come in for criticism for his inability to tackle the problem – as well as for the ailing economy and corruption scandals. Mahama is asking voters to disregard such problems and give him a second term. During his “Accounting to the People” tour this year, he sought to convince Ghanaians at home and abroad that he was delivering on his campaign promise of creating more jobs. He said a revamped sugar factory in Ghana’s western region would create 7,300 jobs and reduce the bill for sugar imports, which he said amounted to $300m. He also commissioned a new “Dubai-style” flyover in a busy business district in the capital, Accra, completed last month. A major blow to his presidency has been his government’s inability to retrieve 51.2m cedis ($11,7m; £9.3m) paid by the government to a ruling NDC party financier, even though the Supreme Court ruled back in 2014 that the payment had been unconstitutional. When the president met Ghanaians in the UK in May, he told them that corruption had to be dealt with in a “more systematic manner” and indicated that he was “working towards a cashless society by 2020”. ’s northern region. He spent much of is 20s and 30s studying, including a period in Moscow, and worked at the Japanese embassy in Accra and for the NGO Plan International. Akufo-Addo may have lost the two previous elections, but it is how he handled those losses that resonates with many in the build-up to today’s poll. He is credited with preventing possible violence in 2012 by not rejecting the outcome – a loss by 300,000 votes to current President John Mahama – and calling for mass protests. Instead, he sought legal redress and accepted defeat after the Supreme Court upheld the result. The 72-year-old son of former chief justice and ceremonial President Edward Akufo-Addo has retained his 2012 electoral promise to provide free high-school education. But the former lawyer, attorney general and foreign minister’s campaign is now focused on a “one district, one factory” policy that he says will industrialise the country. The plan is to establish factories in each of Ghana’s 216 districts. “The time has come for us to move our industrial development forward,” the presidential candidate told a rally in eastern Ghana. In the north, Mr Akufo-Addo said there would be a functioning dam “in every village” to support agriculture. His critics, mainly from the governing National Democratic Congress, have dismissed his promises as impossible to fulfil – but Mr Akufo-Addo insists they are not just gimmicks. Mr Akufo-Addo is also getting good backing from his wife Rebecca. She told a TV show that he was a “very loving” family man. Mr Akufo-Addo is credited with helping to build up the New Patriotic Party, which first contested an election in 1992 when Ghana returned to multiparty democracy after years of military rule. His political career spans more than four decades and he was active in political movements in his early 30s, when he criticised the military government of the time. He studied in both Ghana and the UK before working as a lawyer in France and served as an MP for the Abuakwa South constituency in eastern Ghana between 1996 and 2008.